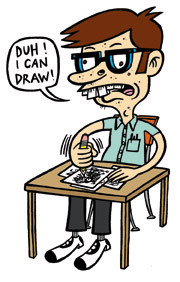 Johnny Ryan has been publishing Angry Youth Comix in one form or another since 1994. At first he really sucked, then he just sort-of sucked. These days, Fantagraphics his publishing AYC and it's totally great! You can also see his stuff in LCD, Goody Good, Measles, Zero Zero and Nickelodeon. Interested in any of the work you see here? Just write and ask. Johnny accepts checks, money orders, and PayPal. Can't get enough Johnny? Visit www.johnnyr.com. Mr. Ryan currently has no unsold art on display.